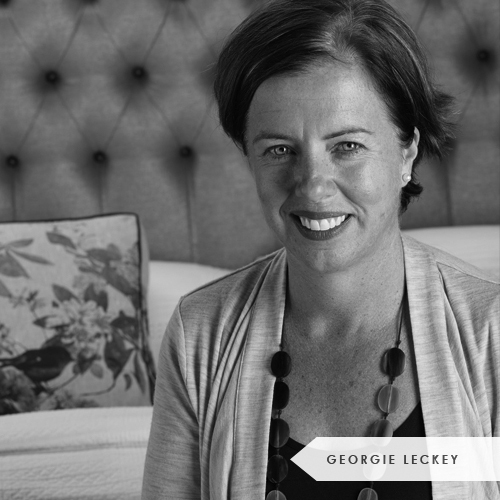 Georgie Leckey knows soft-focus style. Starting out as an interior designer and colour consultant in 2000, she was dismayed at the lack of bedhead options. Her business was born shortly after with a dedication to bedhead styles and upholstered beds, footstools and storage boxes for the bedroom. Heatherly Design is today one of Australia’s leading companies in its genre. She’s the perfect Linen & Moore go-to professional for style advice where it counts: in our homes’ comfort zones. Mottled Grey in particular felts. Which scent are you burning? David Clark and Meryl Hare (Thames & Hudson, $60). Kitchen finishes for my home, honed marble, black appliances and brass pendant lights. Key to a dreamy bedroom? An upholstered Heatherly Design bedhead,of course! Top tips to personalise an interior? Colour, flowers, fragrance and black-and-white family photos. Key to a chic living room? Upholstered coffee table loaded with interior magazines – Belle and Elle Decor UK. Key to a soulful home? The laughter of children and the comfort of a pet. FOLLOW Heatherly Design on instagram @heatherlydesignbedheads.